Mummy Of 3 Diaries: #WIN an amazing Swoops Scooter Balance Bike. WIN an amazing Swoops Scooter Balance Bike. I am excited to show you our latest competition prize. One of you very lucky readers is going to win this gorgeous Swoops Scooter Balance Bike from the Garden Furniture Centre. It's an ideal first bike perfect for any little boy or girl. 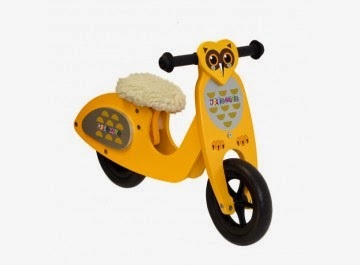 This funky owl themed scooter will have them riding around in no time at all. Make their first lessons in learning to ride fun and safe. The Swoops bike is sturdy but lightweight, made from wood with solid rubber tyres. My little man, Ryan had a balance bike a few years back and loved it. It was so much fun for scooting along on when we were out in the park. He'd speed down the hills and zoom all around the paths. Balance bikes are a great way for young children to learn how to balance before trying to ride a big bike. After a year on a Balance bike my Ryan rode a big boy bike first time as he had already mastered his balance skills. I was so proud. The Swoops Scooter Balance Bike has got strong wooden wheel hubs and Tyre Eva solid rubber tyres. It's been updated with a printed logo and has fab mountain rubber tyres and rubberised handlebar grips. I almost wish I could have a go on this myself. The Swoops Scooter Balance Bike would cost you £59.99 but one of you are going to get it for free! I wish I was you right now - I'm so excited about this giveaway. You can enter this giveaway by using the Rafflecopter Form below. It's really simple to use but please allow a few seconds for it to load as it can be slow at busy times. My little nephew! Thank you! for my nephew who's 2, both of our children age 7 and 4 had a balance bike and could ride with out stabilisers age 3! best invention ever! I think my Goddaughter would love it! My daughter who will love this! I'd be pushing my 2 year old niece pip up and down the back road. my nephew he is 2 in a few week & this would make an amazing gift. My little monkey would love this..so cute! One of my daughters as i have their birthdays coming up - will be 3 & 2! hello there brilliant giveaway !! I would give it to my little cousin. I'd give it to my goddaughter for her upcomng birthday. She'll be just the right age. My son! He'd absolutely love this and balance bikes are great for teaching kids. My niece, she'd love it! The little boy I foster - he would love it! My 2 year old daughter would love this. My Son! He always misses out to his older sister so he would love this!! My Godson's birthday is coming up and this would be perfect to spoil him with. I'd give it to my gorgeous nephew. I would hide it ready for my sons 3rd birthday in July. Would be for my 2 year old son who would love love love it!!! My son! He's a right dude, he's love this! I'd give it to my daughter! My three year old son would love this. He won't pedal a bike. My little girl would love it! Hi there, I have a boy. Here name is Mickeal-ul-sanny, He likes in your son and this bike.Great posting.Thank you. Hi Author! However speed down the hills and zoom everywhere over the paths. Balance bikes are an easy way for young children to be able to balance before trying to ride an enormous bike.